In Central Europe, Poland's economy looks most vulnerable to the financial and economic fallout of the United Kingdom's decision to leave the EU. The national–conservative Law and Justice (PiS) party prevailed in the October 2015 elections gaining 235 out of 460 seats in parliament. Immediately after its inauguration the new PiS-administration launched some controversial policy initiatives, such as seizing direct control of the state broadcasting channels and the security services, and purging the heads of state-owned companies. A major issue is the attempts to curb the independence of the judiciary by imposing political control over courts and the appointment of judges. This has triggered mass demonstrations in Poland itself, while the European Commission has repeatedly warned the Polish government that such moves pose a systemic risk to the rule of law and violate EU statutes. 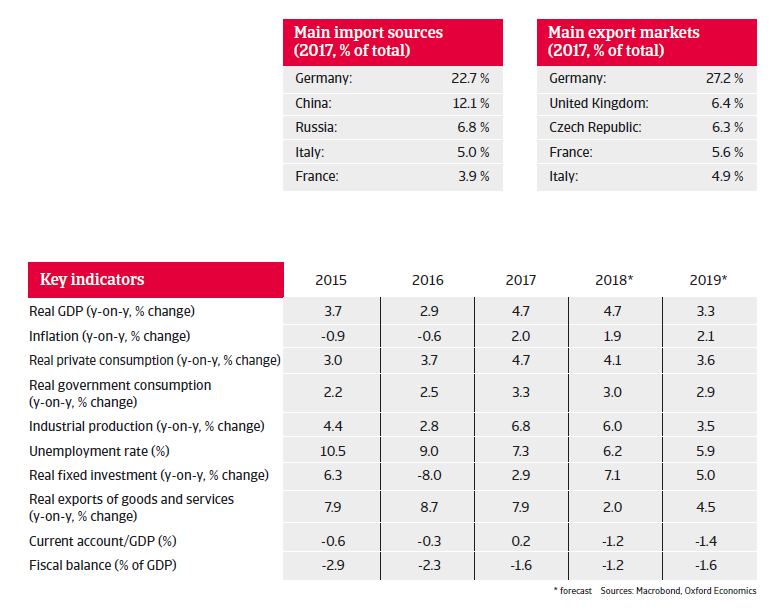 Polish GDP growth is expected to increase again above 4% in 2018, due to robust consumer demand and increased investments. 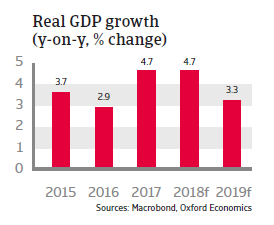 In 2019 the economic expansion is forecast to slow down somewhat, but still to remain solid (above 3%). 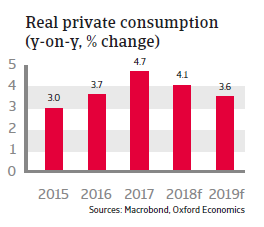 Private consumption growth is underpinned by increasing employment, rising wages and social transfers (e.g. a child benefit programme). At the same time public investments and disbursements of EU funds have been picking up, while export growth remains buoyant. Both business and consumer confidence remain elevated for the time being. Following deflation in 2015 and 2016, consumer prices started to grow again in 2017, fueled by wage increases. They are forecast to remain at about 2% in 2018 and 2019. While monetary policy has been accommodative so far, given low inflation rates in the past, it is expected that the central bank will start to gradually raise interest rates by the end of 2018 in order to keep inflation within its 2% target rate. Public debt is moderate around 50% of GDP. The government’s fiscal deficit decreased in 2017 due to higher tax revenues and better tax collection. However, public spending has increased again as a consequence of a lowering of the retirement age, continued social spending and public investment. Due to the further tightening labour market, shortage of workers is increasingly becoming an issue, especially in the manufacturing sector. 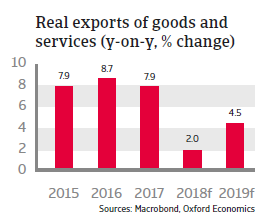 At the same time concerns over adverse economic and domestic policies by the Polish government remain, together with worries over the impact of external factors like US import tariffs and the Brexit decision on Polish export and investment growth. In Central Europe, Poland's economy looks most vulnerable to the financial and economic fallout of the United Kingdom's vote to leave the EU. Annual remittances from Poles living abroad amount to about EUR 4 billion, a large share of it from the UK. In the longer term an EU departure of the United Kingdom could impact EU structural funds, which play a major role in Poland´s economic progress. The UK is also Poland´s second largest export destination after Germany. The proportion of past due B2B invoices is the second highest in the region and almost 60% of Polish respondents said that this affected their businesses. Due to the high export dependence any imposition of import tariffs by the US would have an adverse impact on the sector, especially for Tier 1 businesses. 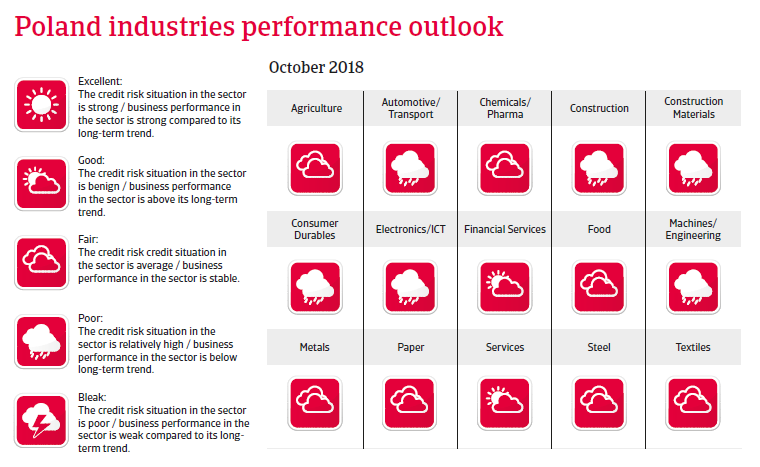 The global economic upswing continues to strengthen but US policy uncertainty and a potential trade war could quickly darken the bright skies.